To help fund my trip to Japan I created a letterpress broadside. To develop the text and imagery for this broadside, I combined an excerpt of text from one of my artist books and imagery from one of my mokuhanga prints. The text and imagery for the broadside is printed from polymer plates made from an ink drawing. 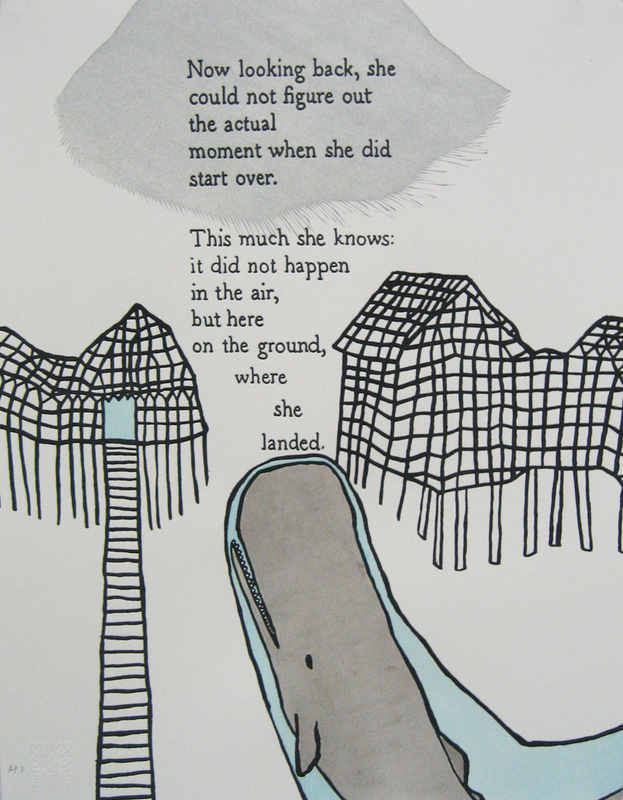 The broadsides are hand colored and printed in an edition of 85. The paper size is 8.5 x 11 inches. They are available for purchase for $35 at my Etsy store. This land was made of fire. And she found it everywhere. When I wrote this text I was thinking about how people are changed by their experiences in the world. 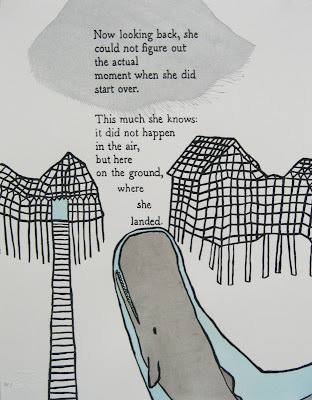 In this poem, the main character is changed by things that are both physical and tangible: the ground that she walks on is unstable and it affects her deeply. The imagery for this broadside was originally developed for a print I did in mokuhanga titled: Throwing Our Things In The River Below. I adapted aspects of the original print for this broadside because the whale emerging from the water created a visual analogue with the printed text. This broadside began with the carving of the cloud shape out of linoleum. The linoleum was mounted on wood in order to make it type-high, locked up and printed on a Vandercook number 4. Because the imagery was too large to print on my 9 x 12 magnetic base in one run, I had to print the image section by section. I made my own polymer plates from a series of ink drawings on frosted mylar. Proofing the polymer plate is essential in making sure the position is correct on the page, the ink is consistent, and that the plate is creating the proper impression. I wrote the poem out by hand and from my own writing made the plate. The text was the final printed layer. After the final layer of printing is done, I am ready to hand paint the whale and the water. It takes a surprising amount of time. For me the printing felt much faster, while in contrast the painting was quite tedious. Fortunately/Unfortunately, I lost track of how many Battlestar Galactica episodes I watched. My painting station at the Vermont Studio Center. and it turned out beautifully! I love mine!